The perfect hard boiled egg. So easy in theory, yet it can easily (and so often does) end up undercooked, or overcooked with that unappetizing green ring around it. The beauty of a perfectly cooked egg gets my stomach rumbling, so let’s begin! Place the eggs* in a pot with cold water. Make sure that there is enough water in the pot to cover the eggs. Bring to a gentle boil. Then, remove the pot from the heat and cover with a tight fitting lid. Prepare a bowl of ice water. Let the eggs sit for 8-12 minutes. 8 minutes leads to a more moist yolk that is a deeper orange color (shown above). 12 minutes leads to a pale yellow yolk. Both are perfect, it is just a matter of preference. After the time is up, place the eggs in the ice water for about 5 minutes. Done! Eggs are incredibly nutritious and a very inexpensive way to make a hearty and satisfying meal. Unless you are allergic to eggs, or vegan, eggs are awesome and your friend. One large egg contains about 6.5 grams of protein, as well as vitamin D, selenium, iodine, vitamin B2, phosphorus, vitamin B5 and vitamin B12. Eggs contain a nutrient called choline which helps to enhance brain function and reduce inflammation. Contrary to past belief, studies are currently showing that eating eggs helps to reduce weight, improve cholesterol profiles and increase cardiovascular health. It is important to underscore the vitamin D found in the yolk, as the majority of individuals do not obtain adequate amounts of vitamin D from the sun. Vitamin D enhances the immune system and promotes calcium absorption, resulting in stronger bones, a calmer nervous system and overall enhanced wellness. The addition of pickles, when properly made, adds a probiotic boost to this salad that assists with numerous health issues. Please read the post on pickles for more information. If you use purchased pickles, try a brand like Bubbies that is found in the refrigerator aisle. If you want this to be a complete real food meal, check out this post for instructions on how to make your own mayonnaise. Mash all ingredients together with a fork or potato masher to desired consistency. *This is not a recipe for your freshest eggs, as they are harder to peel after boiling. Quick tip: add baking soda to the boiling water for easier to peel eggs! Mmmmm egg salad. Thank you for the egg cooking tips! I am so good at cooking so many things, yet so often my hard boiled eggs come out just like you said (under or over cooked). I always time it and it always comes out wrong! thanks for the tips, I will be trying! I'll have to try this method! I have not had egg salad in such a long time and this has me craving a good ol' Egg Salad Sandwich! That egg on top just make want to go and cook a few eggs now! I love eggs, cooked in any way. Love your salad….simple and delicious. Thank you for the tips! 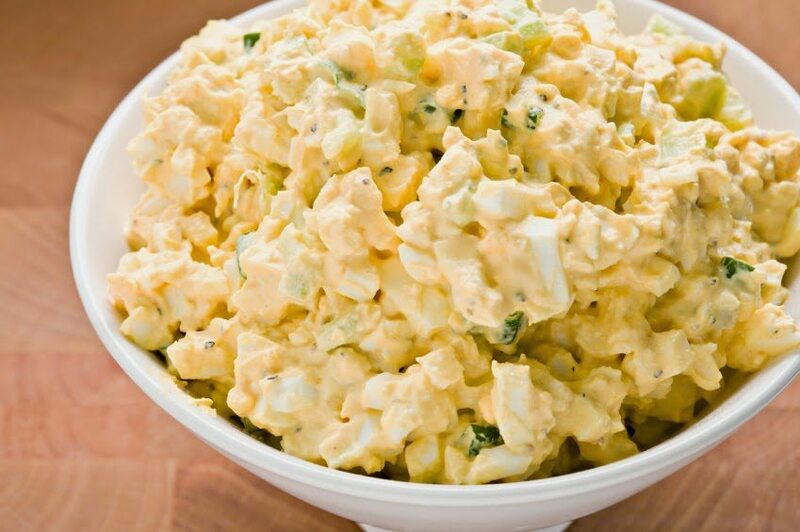 I love egg salad too, simply delicious especially for my sandwiches. Nice and simple. Great recipe! Great! I needed a good hard boiled egg recipe. Or instructions. I always get nervous and overcook! That looks like a great egg salad! I am not very good at making egg salad. I either boil the eggs too long or too short! Thanks for the tip! I also love that you pointed out how nutritious, satisfying and inexpensive eggs are… they've gotten a bad reputation over the years for their cholesterol content. Your egg salad will make a great lunch for work. This looks like a wonderful egg salad! I agree organic pasture raised chickens produce the best eggs. I like this post because it is about EGGS. and I LOVE eggs. thanks for sharing. I love eggs too, and haven't thought twice about the method I've used for years – I got it from my trusty ol' Betty Crocker cookbook. But I never knew why my eggs had that gray-green ring around the yolk. My method was identical to yours, but let them sit for 20-25 minutes prior to cooling! Obviously, that was far too long. We cooked eggs today according to your instructions and they were PERFECT! YUM! Thanks for detailing the method! Thoroughly crush the shell into tiny bits, roll it well between your hands or against a counter-top, and begin peeling where the air pocket is. Be sure to catch the thin filmy layer (sorry, I don't know the name of it) between the egg and the shell. Once you start to peel that filmy layer, it will take the shell with it and because the shell is in tiny pieces, it won't offer much resistance. Hope that helps somebody! Perfect timing. I've not had egg salad in ages, but it's about time I put some eggs to the boil and made up a batch. Thanks for the inspiration! Hard boiled eggs are one of my favorite things to eat and combine with other foods. Thanks for the tips. Wonderful sounding egg salad. Perfect timing for this post!!! Great tips!